I love to paint my nails. It is one of those things that instantly brings an outfit together, and something that you can do to treat yourself for a few minutes. Summer nail colors are some of my favorites. I love the bright colors, especially when I have a little bit of a tan. Lately, though, I've also been throwing in some neutrals to keep it classy. Here's a couple of my favorites lately. Devil's Advocate has been my go to color for a while. It is a great dark neutral for toes. The Orly Color Amp'd seriously stays on forever. I don't even use the top coat that you are supposed to use with it, and it still lasts a good week. I had to add the Sally Hansen Gel Top Coat on there, because I love that you can now give yourself a (sort of) gel manicure with any nail polish. This top coat is really shiny, and lasts a really long time. 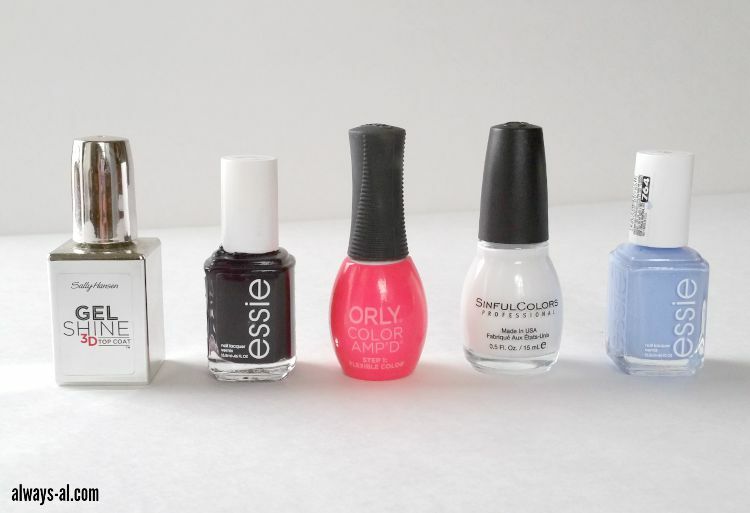 Did you know that Essie nail polish is free of formaldehyde? Formaldehyde is super harmful to skin, and can cause reproductive issues, so it is awesome to see one of my favorite nail polish companies being committed to not using harmful chemicals.